The Government chief whip and Minister of State with responsibility for Gaeilge, Joe McHugh, and Mícheál Ó hÉanaigh, chief executive officer of Údarás na Gaeltachta, with a teacher and student from Scoil Uí Ghramhnaigh, Rath Cairn, Co na Mí. Sixteen Gaeltacht primary schools will undertake a special education programme in science, technology, engineering, and mathematics (STEM ) as a result of the new pilot programme An Chruinne, devised by Údarás na Gaeltachta and Junior Achievement Ireland. 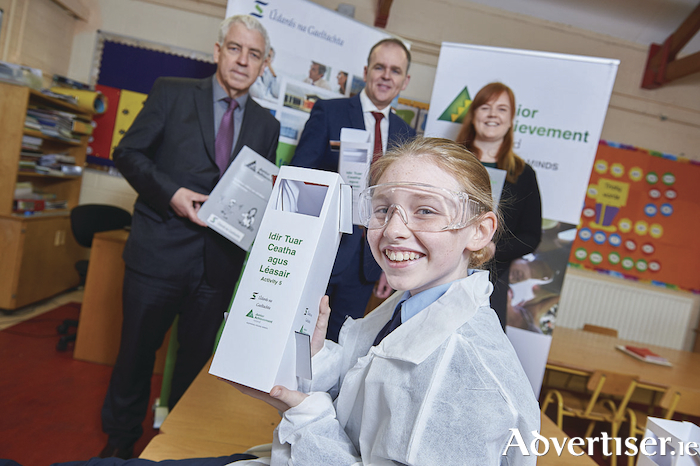 During this academic year, Údarás na Gaeltachta intends to work with Junior Achievement Ireland to roll out the programme in 16 national schools in the Kerry, Cork, Galway, Mayo, and Donegal Gaeltacht areas. The programme consists of five modules and will teach the higher primary classes STEM subjects through the medium of Irish.